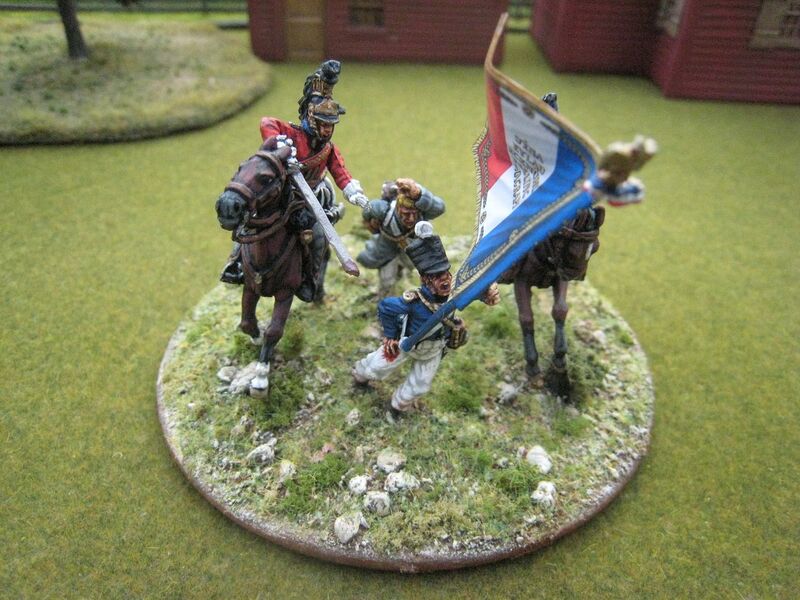 This is the second Perry Miniatures 1815 vignette, the capture of the eagle of the 105st Line infantry regiment by Captain Alexander Kennedy Clark and/or Corporal Francis Stiles (or "Styles"), both of the 1st (Royal) Regiment of Dragoons (the "Royals"). Precisely what happened is disputed, and there is a good account of the controversy in Adkin's "Waterloo Companion". The 105th formed part of the 2nd Brigade, 1st Division of d'Erlon's I Corps, which was involved in the big early afternoon attack on Wellington's centre. When the attack faltered, the brigade was charged by the Royals and 6th (Inniskilling) Dragoons (part of the general charge of the Union Brigade, which saw the 45th Line's eagle captured by Sergeant Ewart). Captain Clark initially took credit for the eagle's capture, saying that he saw a party carrying the eagle, attacked it and struck down the French officer who was carrying the flag. But he couldn't quite reach the flag as it fell, his fingers only touching the fringe, and so he shouted at the nearby Corporal Stiles to pick it up and take it to the rear. However, Stiles' version of events was different - he said that he was ordered to attack the colour party by his troop commander. Clark was wounded at Waterloo and while he was recovering he became concerned that his capture of the eagle would not be recognised. He wasn't aware that the regiment's colonel had already written to his superiors recommending Clark (and two other officers) for promotion. Clark wrote to another colonel for help in having his achievement recognised and a regimental investigation began into what happened. Statements were taken from soldiers who were in the vicinity at the time. Private Anderson said that he saw Clark wound the French officer and the flag then fell across the heads of his and Clark's horses and towards Corporal Stiles. Clark shouted out "secure the colour!" and Stiles managed to grab it before it fell on the ground. Private Wilson corroborated this account, also saying that after Clark stabbed the officer the colour fell against the neck of Stiles' horse and Stiles carried it off to the rear. Stiles asked his troop commander, Lieutenant Gunning, to provide his testimony of the incident. 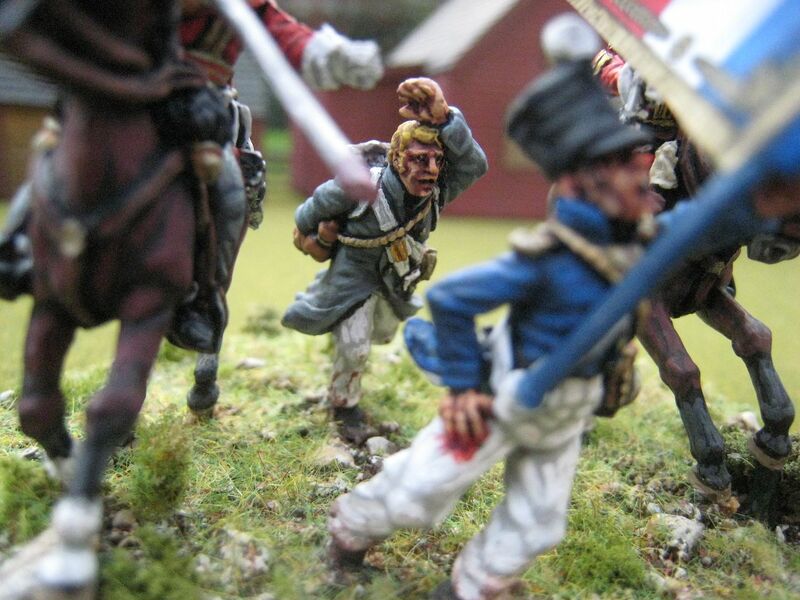 Gunning stated that he spotted the colour party and ordered Stiles and others to attack. Gunning further claimed (I think much later) to have been the person who wounded the officer holding the colour. The result of the investigation appears to have been that Stiles received the immediate credit for the eagle's capture. He was promoted to sergeant and eventually received a commission as ensign in the 6th West India Regiment. Clark seems to have spent the rest of his life feeling aggrieved at what had happened, writing to the authorities (including Lord Uxbridge) some ten times to claim credit for the colour's capture. Clark never received any formal recognition and the quick promotion he had sought to obtain on the back of the colour's capture eluded him. He was promoted to major in 1825 and made lieutenant-general rank five years later. In 1835 Clark was still claiming credit for the eagle's capture, in letters he wrote to William Siborne to assist the latter with his history of the Waterloo campaign. Who's the chap with the flag? 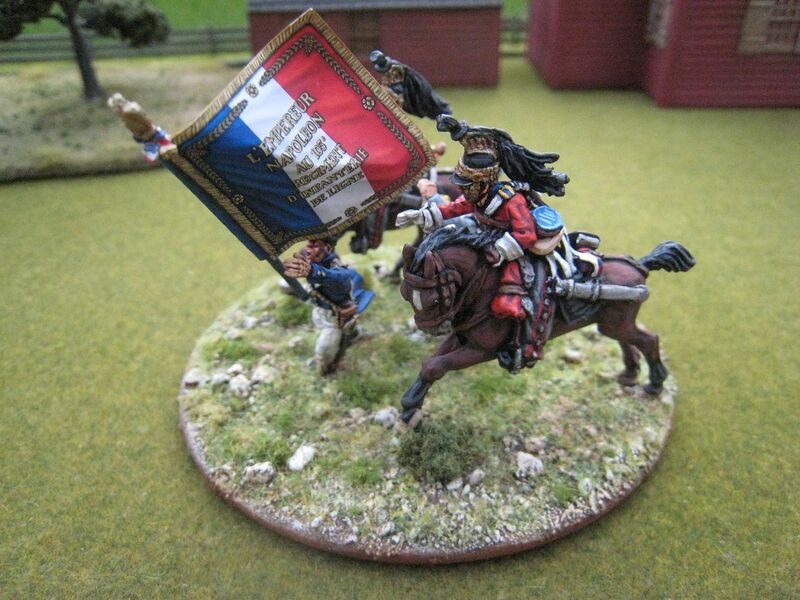 Another mystery is the identity of the French officer who was carrying the colour. 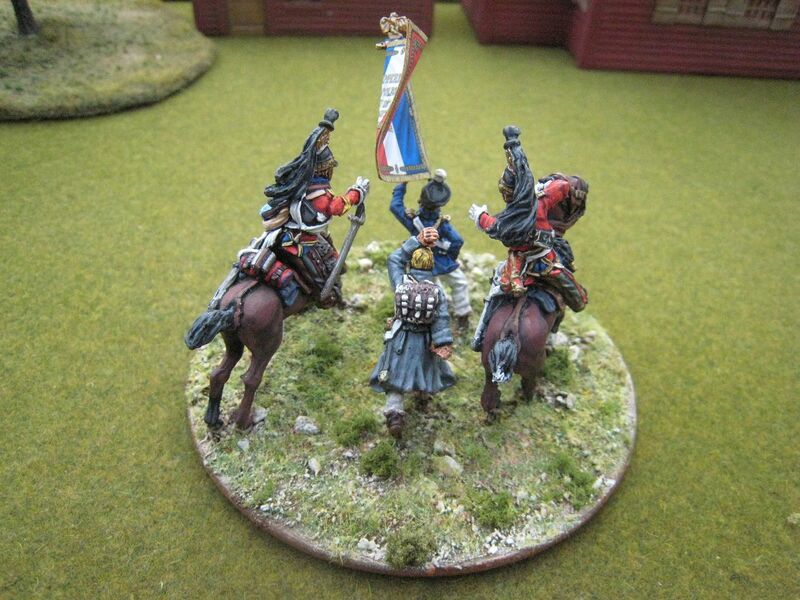 The "porte-aigle" of the 105th was Jean Chantelat, who survived Waterloo but was wounded by a gunshot in the leg. So at some stage some other officer must have taken charge of the eagle (one of the testimonies of the cavalrymen suggested that this was the 105th's commanding officer). A further issue was raised in the 1830s, when Private Penfold of the Inniskilling Dragoons claimed that he capture an eagle which he then dropped and was picked up by a man from the Royals. Who knows what really happened? Maybe it's best remembered as a team effort - in 1838 the Royals were given the distinction of carrying the eagle on their guidons and I gather the Blues and Royals still wear an eagle badge on the left of their tunics. I think this is a terrific vignette. It has more immediacy than the corresponding Ewart set, and you really sense the cavalrymen desperately reaching out trying to grab the colour before it hits the gound (if you'll pardon a Classical allusion, the set reminds me of that rather gory bit in Book II of the Aeneid when, during the sack of Troy, the Greek Pyrrhus is pursuing Priam's son, Polites, and eventually cuts him down right in front of Priam: "iam iamque manu tenet et premit hasta" - "now, even now, he holds him with his hand and presses him with his spear"). 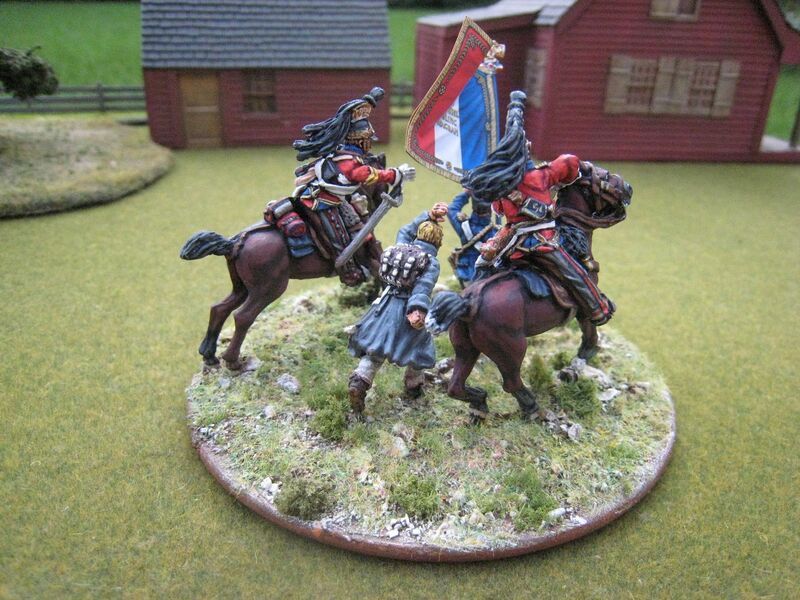 The drummer figure is a great touch - he suggests how terrifying it must have been to be ridden down by cavalry. 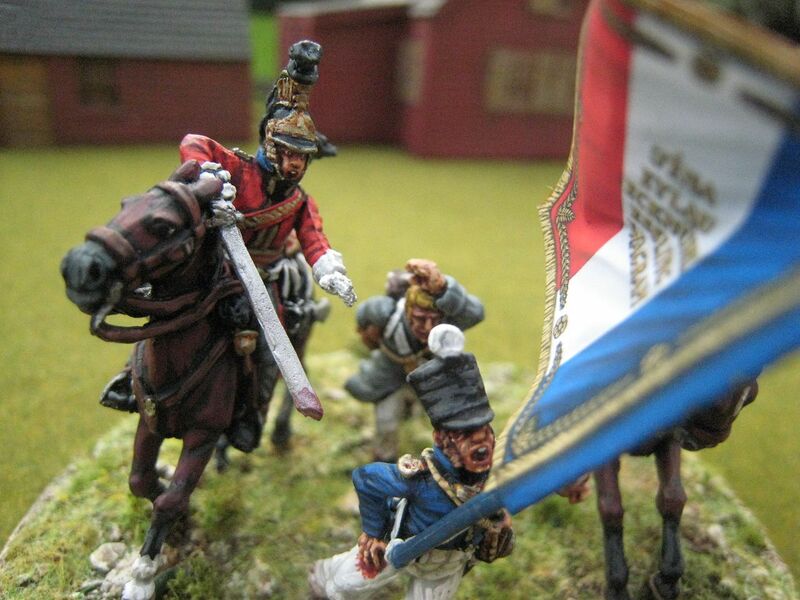 I found some conflicting sources on the dragoons' uniforms. The stripe on Captain Clark's trousers is either yellow or red, depending on what source you use. Apparently the Royals' horses were supposed to be blacks, but they had supply problems in 1814/15 and so I think it's legitimate to use bays. 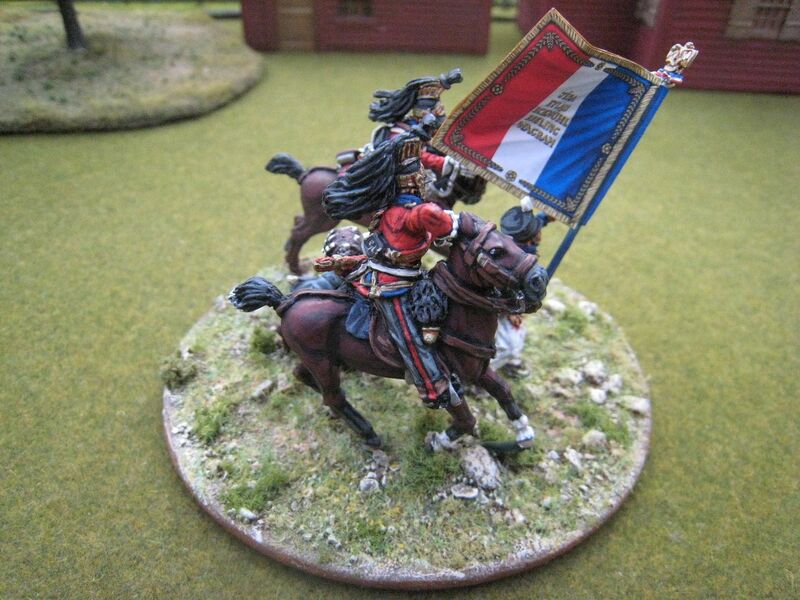 I see that I forgot to add golden "N"s to the French officer's turnbacks, and I didn't bother trying to replicate the muddy/cornfield look of the Waterloo battlefield on the base - never mind! 4 figures. Painted November-December 2015. Flag from GMB.